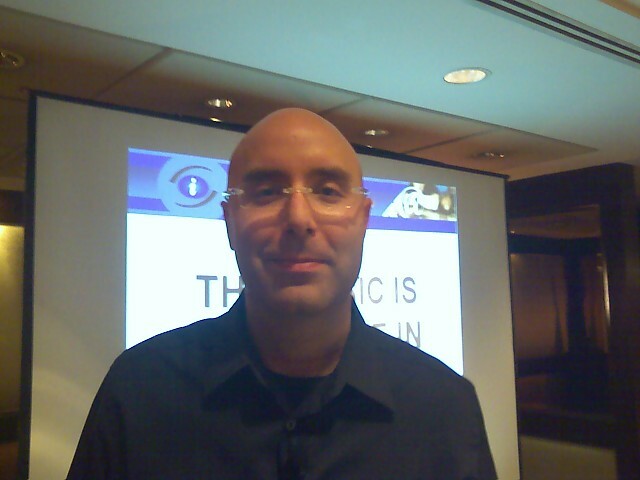 Mitch Joel from Twist Image presented Social Media Marketing and Web 2.0 today. Previous: Previous post: What is MN2? It started at 8:00 am and went to a little before 5:00 pm. It was a long day but it only seemed like a few hours. If you have never heard or seen Mitch Joel do yourself a favour and don’t miss him. This person has a passion with a capital ‘P’. He explains, teaches, provokes and doesn’t always agree with the audience but that passion shows every single minute. He is punctual and that again is with a capital ‘P’. Of course the overhead wasn’t working at the beginning but we all received a bound handout of the 281 page presentation. These were not your typical PowerPoint bullet point ‘Captains of Industry’ presentation pages. And so we started without the tech apparatus and you didn’t feel you were missing anything. This presentation had a lot of punch with liberal use of the net and videos. He punctuated the necessary emphasis with choice language. If there was an easy way to make a point Mitch found it. When you came away you knew you had something to chew on for a long time. You can see the course outline at IAB Canada here. What made this presentation different than the plethora of tech courses always offered? You always felt he was talking directly to you. Even if what he was presenting was already known, he made it feel ‘new’. We could have spent another day just in discussion about all that was presented. So when does the level two course on Social Media Marketing take place? We will all be back. And like you said Mitch, this is just the beginning. These are some VERY kind words! It was GREAT to meet you and I look forward to running in similar circles soon. I attended the day long course in Toronto and felt the same energy that you mentioned above. I have since been implementing the practices that Mitch spoke of including the Google Alerts which has brought me here to your blog. I will certainly be watching the evolution of Web 2.0 (also referred to as “IS” in comparison to “WAS” during the presentation) closely as well as Mitch’s / Twist Image’s popularity! I think Mitch has a great presentation and some key elements that are suprising. His presentation is part of the message. And he had a ton of tips like the one you mention. A few years ago there was a 2 day session with David Allan of Getting Things Done. Mitch reminds me of him, lots of energy, tons of stuff to compile and a lot of common sense.